Primer is one of the most necessary items that every woman needs in her makeup box. Primers, unfortunately, are the least used and least understood. Primers are used before adding eye shadows, foundations, and lip color. They are used to enhance and bring out the actual color in your makeup. When using a primer the color is exactly like the color you see in your eye shadow palette, foundation bottle, or lip palette. You also end up using less of the color since it shows up after only one or two applications when using a primer versus applying a thousands of times to achieve the color desired. Check out the picture above without primer and with primer. 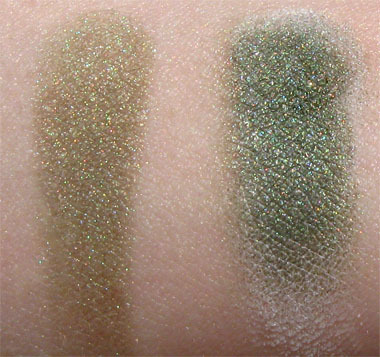 The swatch one on right side has primer and the one of the left side has no primer. There is a huge difference since the actual color from the palette is exactly like the color on the right. The color is bright, enhanced, and prominent. You get your money's worth when using a primer with pigments and colors since you use less of the product in the end. One of the best primers around and that I love to use is from Urban Decay primer potion. It is absolutely great and it is one of the best sellers when I used to work for Sephora. Another one that has also worked great for me was Benefit Lemon- aid. Both work for every skin tone and actually make a huge difference once you use them for your eye shadow. A makeup artist should never be without them!